The first electronic music festival and meeting point in Dominican Republic will take place from 19th to 21st of April. 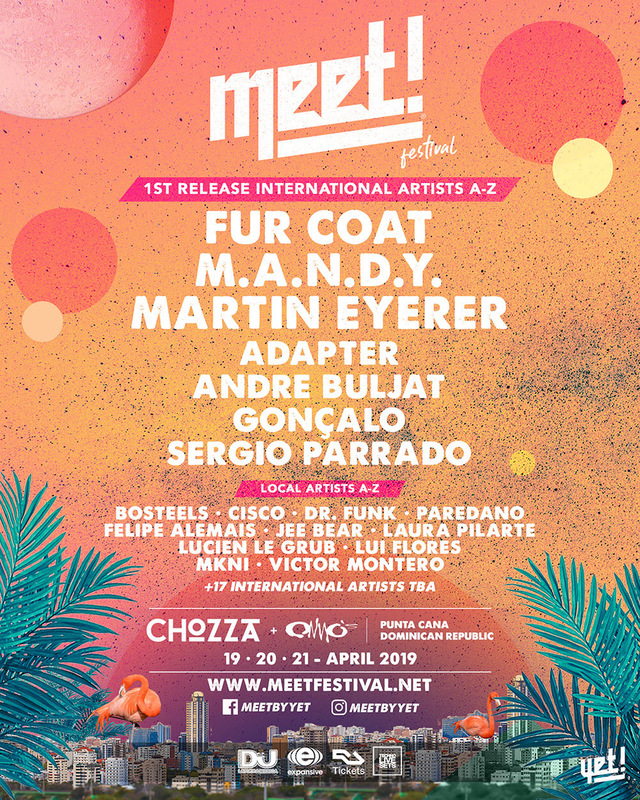 ● M.A.N.D.Y., Fur Coat, Martin Eyerer, Sergio Parrado, Gonçalo, Adapter and André Buljat happened to be the first international names confirmed for a line-up that is about to have more than 30 artists. ● Besides its musical schedule, the newborn festival will have a wide and varied activities offer. Propelled by the label YET Records, MEET! is the first big event of this kind that will take place in Dominican Republic, specifically in Punta Cana and it’s so much more than just a big event as it is! It’s the perfect meeting point for professionals, labels, artists, brands and audience, as well as for the last music trends. And, all above mentioned, located in the Caribbean, one of the most idyllic natural environments of the planet, which doubtlessly makes the MEET! a dream come true. Festival promises to be of an international reference and enjoyment of the Easter Weekholidays with the best electronic music – the celebration will take place from 19th to 21st of Aprilin the innovative space of Chozza. The music schedule will be compound by the 33 artists, 4 showcases and 3 stages. M.A.N.D.Y., Fur Coat, Martin Eyerer, Sergio Parrado, Gonçalo, Adapter and André Buljat are the first international artists confirmed on the list that will have big timeless classics and essential figures of the current scene. Besides, the support of emerging talents, both local and foreign, will be one of the pillars of its line-up…also, an exquisite care for the technical details as an indispensable premise for its production team. Here’s a bit more…Along with the wide musical spectrum, MEET! will offer a huge variety of alternative activities for the absolute fun: Daytime Beach Parties, a suggestive gastronomicoffer and free access to Aquapark for all present. The tourist attractions of Punta Cana and Playa Bávaro complete the entertainment offer rarely seen in electronic music festival.